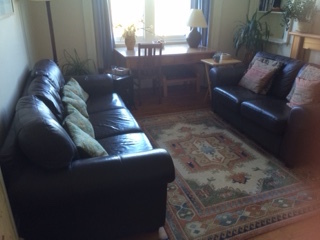 I work from quiet, comfortable, first floor premises in the Meadowbank area of Edinburgh. There is free on-street parking and several LRT bus routes pass nearby (4, 5, x15, 26, 44, 45, 116). I offer daytime and evening appointments. Counselling sessions are usually weekly and last 1 hour. We can agree to work for just a few sessions, or for a longer period, depending on your needs and wishes. My fee is £45 per hour. I have a limited number of concessionary spaces and operate a sliding scale for these. I do ask for payment if sessions are cancelled with less than 48 hours notice.